HELP EXPAND THE ELECTORATE - WRITE POLITICAL POSTCARDS AT HOME! 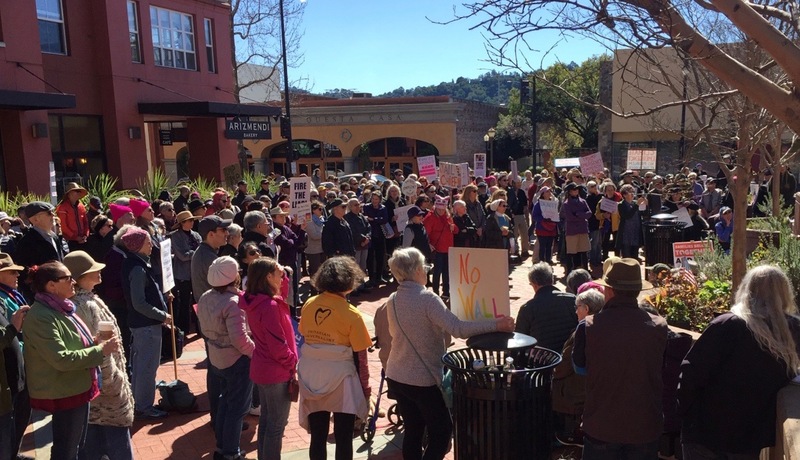 Previous rally in San Rafael. HELP STOP TEXT MESSAGE CENSORSHIP! URGENT ACTION REQUESTED - QUICK EASY ACTION TO HELP SAVE TEXTING! Many of you texted voters for the 2018 Midterms. Texting is one of the most powerful tools we have to get out the vote. But the Trump Administration/FCC has just given cell phone companies new powers to control our text messages. Companies like Verizon can now legally raise rates or block text messages they don’t like being sent-- by activist groups, schools, or private companies. We have a chance to protect texting, but the deadline is Tuesday, April 2. The FCC is taking public input on whether to restore protections against text message blocking. The deadline is April 2 to submit your response, so we urgently need your help to flood the docket with the voices of concerned Internet users. Once you click on this link, all you'll need to do is enter your info and send the message provided. Please act soon! SUNRISE SPEAKERS! Join us Sunday, April 7, for a special environmental-themed program at our MVCAN Monthly meeting. 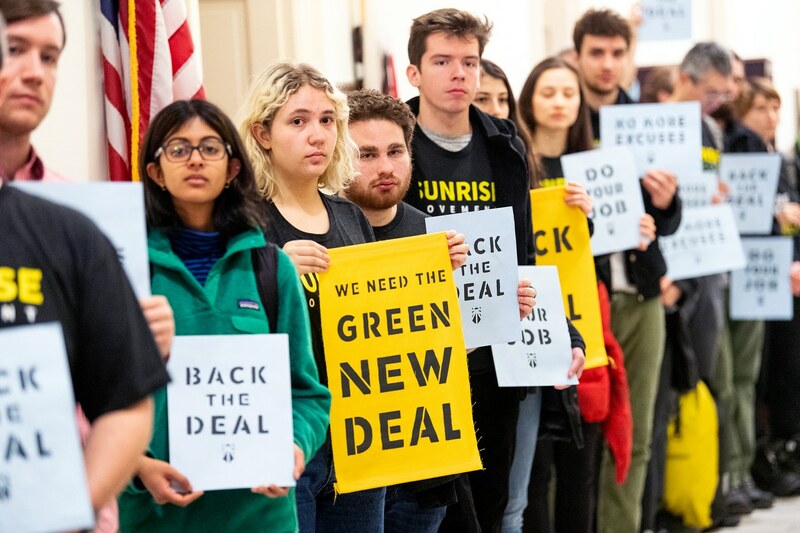 Young activists Alex Morrison and Josh Kocher from the Sunrise movement will discuss the Sunrise movement’s recent emergence, give an overview of the Green New Deal and tell us how other groups can work with Sunrise going forward. In addition, our local Eco expert Max Perrey, former head of Sierra Club Marin and current CA Dem party delegate, will speak on California’s fight to limit carbon emissions. Plus, hear lots more at the meeting about MVCAN’s broad range of events and actions this spring! And KUDOS to Chris Lydon, Rebecca Brackman, Carol Korenbot and their team for making every amazing monthly meeting happen! Slides will be presented by Helen Rosen and Barbara Rowe about their Southern border trip in February, including their observations of immigration court and a desert migrant walk. Also on the agenda will be an update from ICE Out of Marin and the Human Trafficking program recently held at Dominican University. 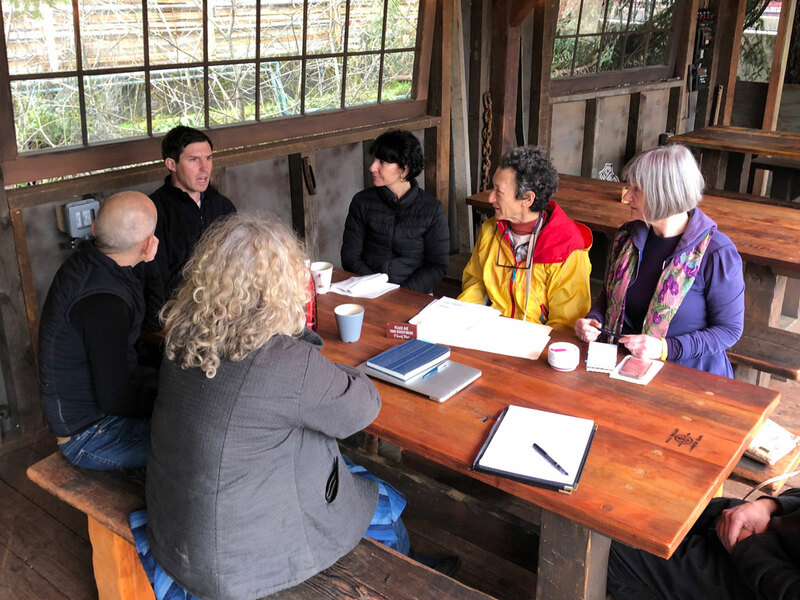 In order to solidify 2018 wins and be ready for 2020, the Marin Democratic Party is getting to work now, focusing on voter registration, both in Marin and in the 7 CA Districts that democrats flipped and need to retain. Building our voting base can only help in the 2020 contests! 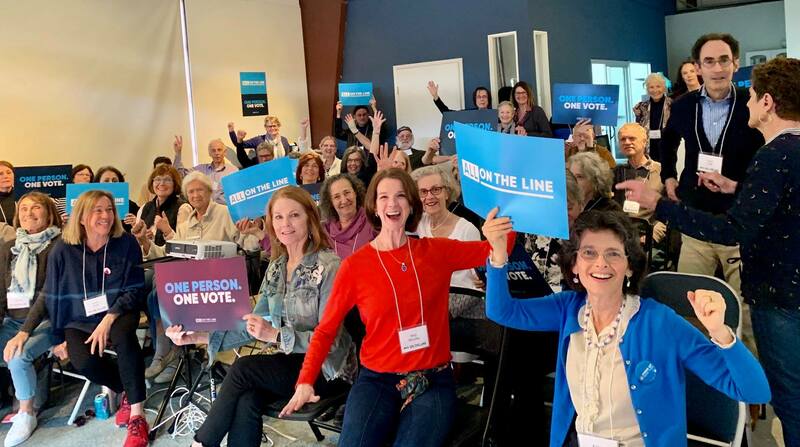 We are thrilled with the enthusiastic launch last Saturday of the “All On The Line” (AOTL) campaign to ensure fair redistricting in 2021. 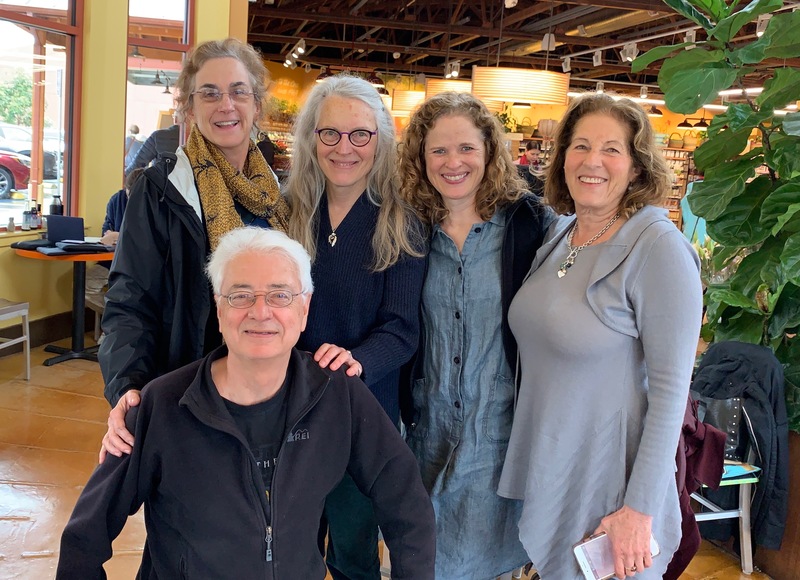 A group of 50 supporters met in Sausalito, including leaders and members from OFA Marin, Democracy Action Marin and Mill Valley Community Action Network. All of us participating in this campaign will now be called All On The Line-Marin. The AOTL campaign will target 10 priority states to make sure that we get fair redistricting in 2021: AZ, CO, FL, GA, MI, TX, WI, PA, NC, and OH. Our role is to build public awareness, mobilize voters and address gerrymandering at the city and county level. We will phone and text to the target states and support groups in CA who are working to get a fair and accurate census, which is the basis of redistricting. For more detailed information, please visit the All On The Line website and the National Democratic Redistricting Committee website. Consider donating here to All On The Line to help them build the team they need to be effective. ALL ON THE LINE House Party last week in Sausalito to restore fairness to our democracy and ensure every American has an equal say. From left: June Cooperman, Bernard Catalinotto, Kate Sears, Eileen Fisher, Rebecca Brackman. 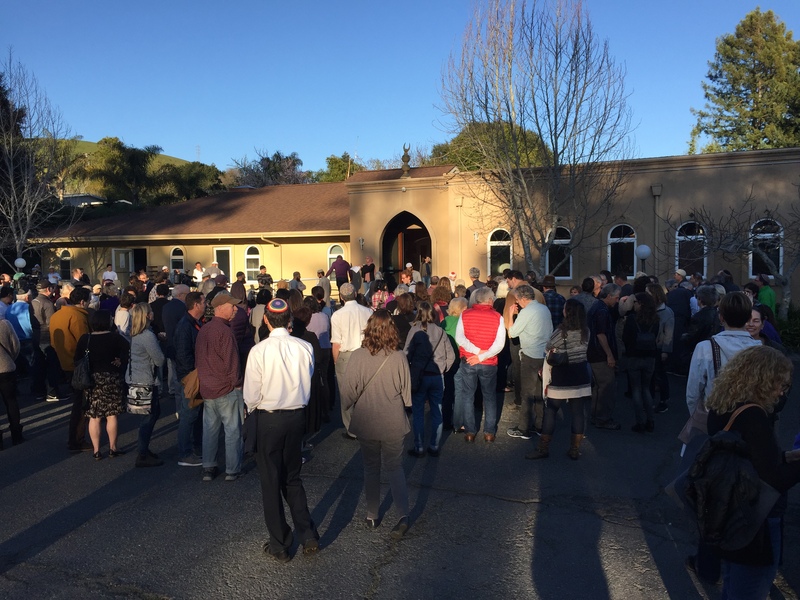 On short notice nearly 20 MVCAN members joined more than 200 community supporters in the wake of the New Zealand massacre. Many faith leaders spoke to the crowd and made moving statements of tribute and solidarity. WRITE POLITICAL POSTCARDS AT HOME! Join MVCAN member Bob Haar in postcarding project to help expand the electorate! 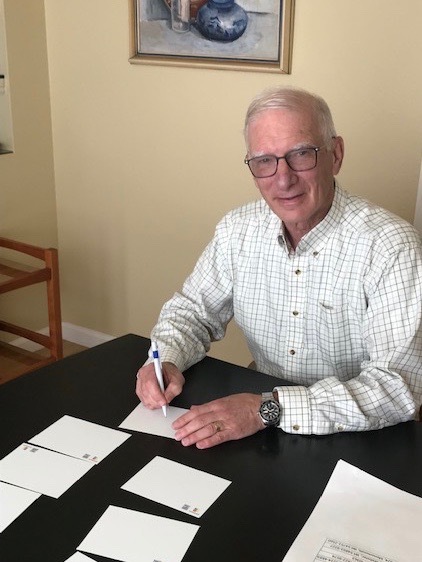 In March, Marin volunteers sent 340 postcards to targeted voters in CD-48, thanking them for voting in one of the close mid-term elections where the Democrat flipped the seat. These postcards went to first-time Democratic voters to encourage them to continue voting! In April you can again write postcards FROM HOME to Democrats who were first-time voters in a close 2018 election. We want to thank them and urge them to keep voting Democratic. You will get a package that includes instructions, 20 pre-stamped postcards, 20 names/addresses, and a script. After you mail the postcards, the package is to be returned to Bob Haar with $8 reimbursement for the 20 pre-stamped postcard. Alternatively, you can avoid the logistics of delivery and return of the postcard package by buying the pre-stamped postcards yourself at your local post office. To participate in postcarding, contact Bob Haar at politicalbobh@gmail.com. Please encourage your friends or neighbors to join in. Gun safety activists from around the state are lobbying for the California Violence Intervention Program (CalVIP) which is a critical component of our state's public safety agenda and urgently needs additional funding. Oakland is a prime example of the impact local, community-based organizations could have with funding from CalVIP. From 2015-2017, the state provided $1.5 million to Oakland Ceasefire; since the group's launch, the city has seen a 43% drop in homicides and a 49% drop in non-fatal shootings. Change starts at the local level, and by increasing CalVIP funding to $39 million, we can create a safer future for communities across California. 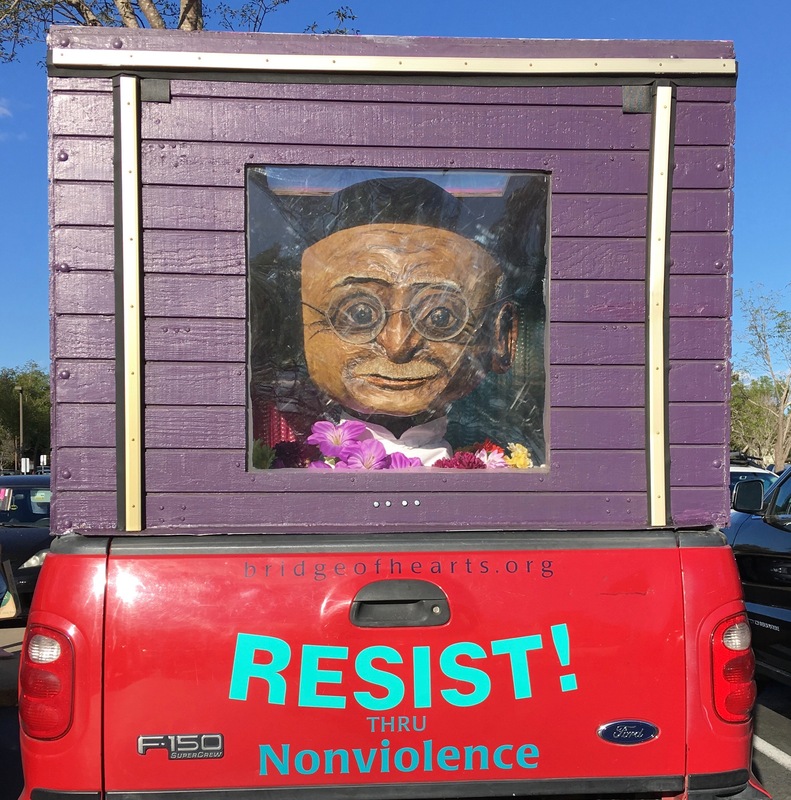 TELL CALIFORNIA STATE LAWMAKERS - FUND CALVIP! 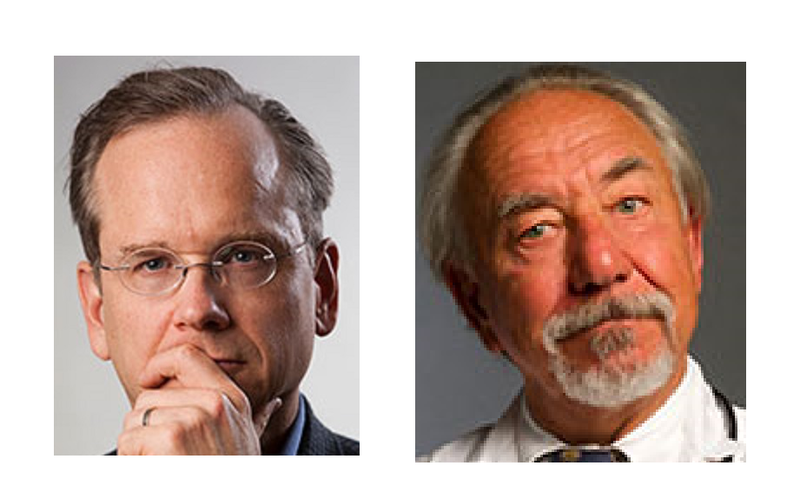 The Mill Valley Library is having an April series, "Views and Voices: Immigration: Building Bridges Instead of Walls." In the first event of the series, Mill Valley Library is partnering with film director Jean-Michel Dissard and Tamalpais High School to share the stories of local immigrant students. “I Learn America,” features stories from high-school students highlighting our shared humanity and challenges. The Library will screen Dissard's film I Learn America. Additional dates for the immigration series at the library will be: April 22, 29, and 30. See details below. In addition to the stories of immigrant youth in Marin, Lauren Markham, author of The Far Away Brothers, discusses the story of the Flores twins' experience from El Salvador to Oakland. Register here. Markham's book, Far Away Brothers, described by the New York Times as 'impeccably timed, intimately reported and beautifully expressed' is one of the featured selections of the Views & Voices Book Club. Other featured selections include Exit West by Moshin Hamid and The Best We Could Do by Thi Bui. Read the featured selections or one of your choosing related to immigration before the discussion. Register here.